I'm sure I've featured this on WoW before, but there's only one month left! I loved Just One Day so much. I can't wait to read the sequel. This one is popular on the WOWs I have to catch and read the first one. Thanks for sharing. Okay, this pick is awesome. I LOVED Just One Day and I really, really need this. Oh I need this! I had momentarily forgotten about how much I want this one and now the need it back. I fell in love with Just One Day and I can't wait to get my hands on this one. Incredible pick! I hope you enjoy reading it as well. Oh! I still need to read Just One Day, but I already have this on pre-order. Great pick! Yes, yes, yes, yes, YES! I'm all over this one and almost cried when they said no to me via Edelweiss! *sniffles* But I'll get over it, buy it and, I'm sure, love it! 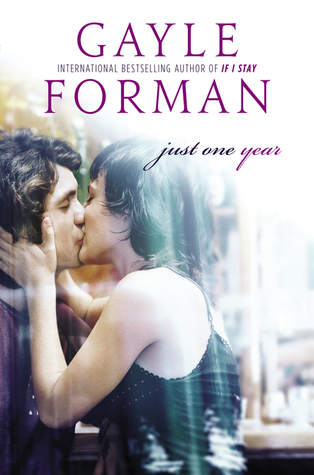 I have a love hate relationship with Gayle Forman's work I love some of it but not all of it. I will still be checking this out and hoping it's great! I was lucky enough to read the sequel a month or so ago. It's fantastic. Great pick! OMG! I got this book and I'm so excited to read it!! I still haven't read the first book, but I hope to do so soon! Nice! Seeing a lot of this one lately! Hope you love it too! I cannot wait for this one to come out! It is on my list as well :) Thanks for sharing. I've read If I Stay and Where She Went, but I still need to read Just One Day. I am planning on reading it, though. I can't wait to read this one! Come on already! I've heard some really good things about JOY so I hope it lives up to your expectations.